Body Art Quality. Triple-Sifted. Superior Coloring. This is 100% pure, body-art quality henna: Super-fine, triple-sifted texture releases maximum pigment and treatment agents. It’s the magical base to all our beard dye blends. Safe, Gentle, & Always Looks Natural: Henna (Lawsonia inermis linn) has a natural pigment that leaves whiskers with a distinctly deep rich orange/red color. It colors boldly yet maintains natural undertones and highlights. A trusted safe beard color & treatment for over 5000 years. Go for it! This is 100% pure, body-art quality henna: The super-fine, triple-sifted texture releases maximum pigment and treatment agents. We use it (and love it) as the magical base to all our beard dye blends. Your beard will absorb and retain the greatest possible amount of Lawsone (Henna Pigment) with our signature Select Harvest™ product. The color fuses naturally to your whisker protein and safely lasts for weeks. During the coloring process, natural agents treat the skin, follicles, and whiskers. They rinse-out fuller, cleaner, and refreshed with reclaimed luster. Only Henna can provide this unique color & treatment combo—and we only sell premium henna. Henna (Lawsonia inermis linn) has a natural pigment that leaves your beard with a distinctly deep rich orange/red color. It colors the whiskers boldly yet maintains natural undertones and highlights—use it once and you’ll be a raving fan. This color will bring attention to your precious beard. It’s been a trusted beard dye & treatment for over 5000 years. Rājasthān Select Harvest™ Henna: Superior Balance & Color Depth. It’s grown near the desert just north of the Mt. Abu Green Belt—in the Northwest region of India, Rājasthān. A hearty, rich coloring henna that has a perfect balance of deep crimson red and vibrant sunshine orange. Leave it in your beard longer for the deepest red to auburn expression, or rinse early and add lots of heat and sun to express brighter orangey-citrus tints. Simply smashing either way! Grays and blondes will express a bright orangey-red, while medium to dark brown beards will tend to be much darker, a deep red auburn color. Very dark brown and black beards will take on red undertones and reflect even warmer colors in direct sunlight. *Color will build on previous application. Deepens & improves as you use. 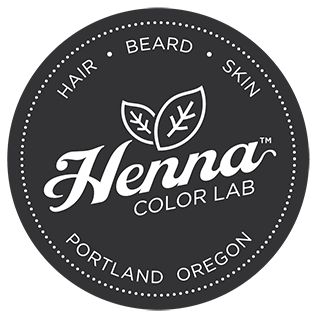 Henna will add sheen and luster to your beard while balancing out natural highlights and undertones as it dyes the whiskers. Unlike traditional “staining” chemical dyes, henna does Not cover up the whiskers—it fuses with the hair, appears natural. Ingredients: 100% (Lawsonia inermis linn/Rājasthān Select Harvest™) natural henna…(that’s it). 100% Lawsonia inermis linn (Rājasthān Select Harvest™ Natural Henna). Awesome product! I’m a black man, mid-50s, light completion and salt n pepper hair and 1 1/2 inch full beard. The product worked exactly as advertised. The black hairs turned a darker burnt orange while the grey turned a perfect aurban. I only dyed the center portion of my beard for a dramatic yet subtitle statement. The color looks natural even though the remainder is black & grey. I get frequent complements. My barber did the initial application but I’ve maintained it at home w no probs and this is my first experience ever w dying anything! It took about three applications to get the full effect and I re-apply every 2-3 weeks to keep it. Couldn’t be more pleased w the product.